Turkey has always been famous for its robust Turkish coffee and strong black tea. Did you know that along with the beverages themselves, the preparation and consumption of tea and coffee are an integral part of Turkish culture and daily life? It's not only the British who are famous for their tea. 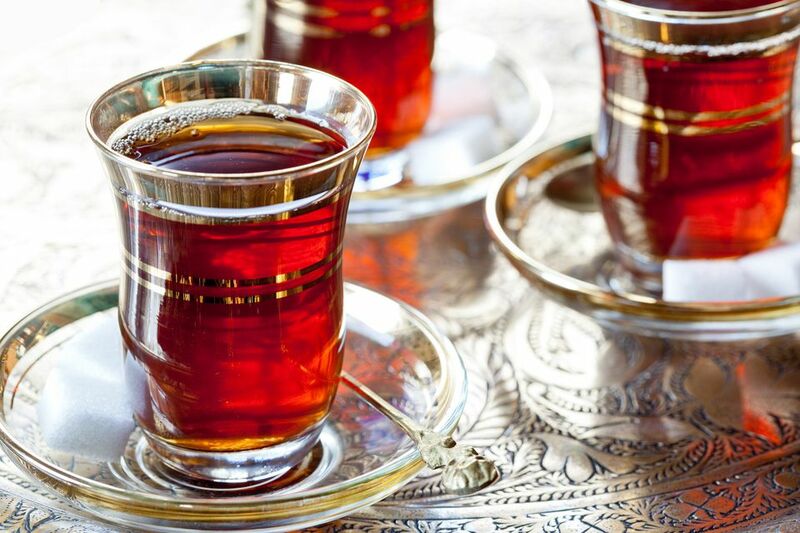 Turkey has a tea, or 'çay' (CHAI') culture all its own that's steeped in hundreds of years of tradition. To start, Turkey is among the world's top five tea-growing countries, producing about six to ten percent of the world's tea. Most of this is consumed domestically. Turkey's tea-growing region stretches along the country's northern Black Sea coastline from the Georgian border through the city of Rize further West. In Turkey, tea is consumed all day long starting with breakfast and continuing right on through until bedtime. Offering tea and drinking tea together is a gesture of friendship. "Teatime" is usually between three and five in the afternoon, where tea is served along with delicious sweet and savory biscuits and cakes. But tea drinking is not limited to these few short hours. In every home and workplace, a pot of tea will always be brewing and ready to drink or offer guests. Workplaces are required by law to allow at least two tea breaks within the working day. Offering a glass of tea to a newcomer or guest is customary, and refusal is unheard of. If you're traveling around Turkey as a tourist or you are one of the locals, there's nothing like reading the morning paper or your favorite book under a trellis covered with vines and sipping a warm glass of tea. You've found yourself in a "tea garden." Tea gardens are simple, leisurely places where old friends meet, young people discreetly flirt and many-a-game of backgammon are played over cup after cup of tea or Turkish coffee. There are lovely tea gardens along the Bosphorus, in the narrow, winding side-streets of old Istanbul and in the touristic cities along the Aegean. To me, there is nothing like the fragrance of freshly ground Turkish coffee, better known as 'Türk kahvesi' (TURK' KAH'-vay-see). Turkish coffee is like a rough version of espresso. Each cup is prepared individually in a small hand-held kettle, called a 'cezve' (jez-VEY') and served in elegant little cups and saucers. The ground coffee is measured with the water and the amount of sugar desired, and slowly cooked to perfection. Once in the cup, the grains settle to the bottom, so drink it slowly! Many tourists get a nasty surprise when they try to gulp it down too quickly. Well-prepared Turkish coffee has a thick froth on the top, and should be filled right to the edge with no spilling allowed - even while you carry it! Like tea, Turkey has a lot of culture built around making and drinking Turkish coffee. Turkish coffee is consumed after a large meal, or at tea time in place of tea. Turkey's rural villages are famous for their coffee houses. Local folks spend long hours chain-smoking, playing cards, sharing their woes and sipping Turkish coffee. But ladies beware! If you venture into a traditional coffee house, you'll find yourself in a sea of mustaches and probably get some strange looks, too. Coffee houses are frequented only by men. If you can't resist the coffee house experience, there's actually a women's-only coffee house in the touristic Aegean town of Bodrum. A prospective bride-to-be is often judged by her potential fiancé and his family by how well she prepares and serves Turkish coffee. Fortune-telling with Turkish coffee among family and friends is an age-old tradition. Once the coffee is finished and the cup has cooled down, it's inverted onto its saucer, held in place and rotated clockwise a few times. When the cup is slowly lifted, the fortune teller will read the coffee drinker's future from the patterns the grains leave on the inside of the cup and saucer. Although most people do it for fun, some take it very seriously, especially those seeking good fortune or a potential mate.